Bloody Sunday also known as the Bogside Massacre took place on January 30, 1972. 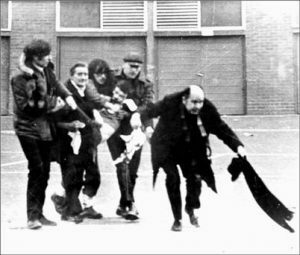 In Derry, Ireland, 26 civil rights protesters were shot by members of the 1st Battalion of the British Parachute Regiment. The march’s planned route was to go to Free Derry Corner. A small group of teens broke off from the main group and attacked a British army barricade with stones, shouting insults at the troops as they marched along. As they continued on their path, the Brits used a water cannon, tear gas and rubber bullets. At a certain point a false report of an IRA sniper operating in the area was given to British troops. The order to fire live rounds was given, and one young man was shot and killed as he rand down Chamberlain Street away from advancing British troops. That first fatality, Jackie Duddy, was among a crowd running away. He was running alongside a priest, Father Edward Daly, when he was shot in the back. The photo of this priest, holding a white handkerchief, went worldwide, causing much shame upon the British. On that fateful day, 26 protestors were shot, thirteen people, six of whom were minors, died immediately, while another person died 4.5 months later from injuries he received on that day. Two protesters were injured when run down by army vehicles. All those shot were unarmed. Five of those wounded, were shot in the back.